I have written quite a bit about this small coastal town on my blog. Since moving to Norfolk, it has been our destination of choice when we have fancied an afternoon at the beach. It is only nineteen miles from here, so about twenty minutes in the car, when not travelling in peak season. 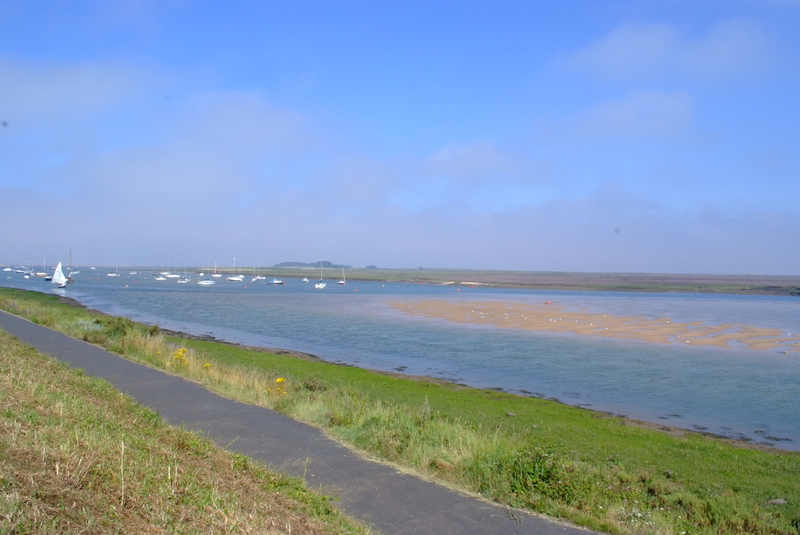 As well as the quaint town and harbour, a long elevated pathway leads to wonderful beaches, fringed by pine forests, and the North Norfolk Coastal Path. Dogs are allowed in certain areas all year round, so it is an ideal place for us to go. These are all large files, and can be clicked on for detail. However, it was getting late, and heat haze was a problem too. In August 2012, we had been living here for almost seven months, and we went up to Wells for an afternoon out. 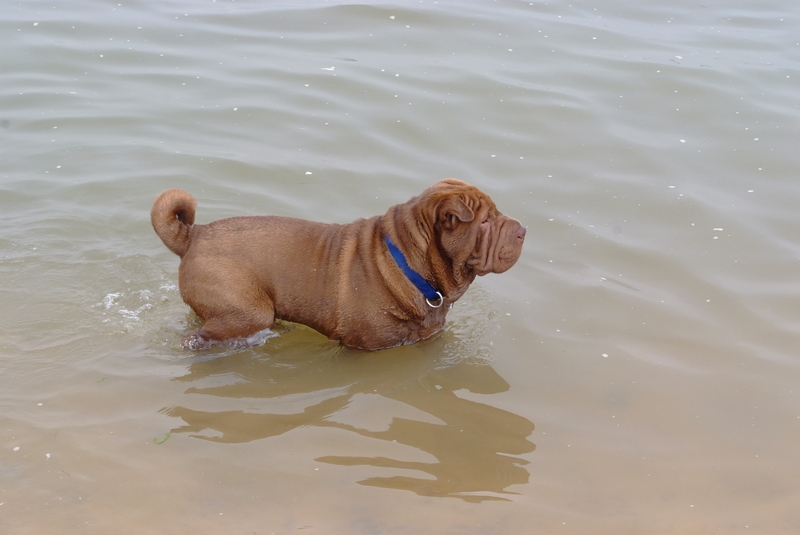 Ollie was only six months old and still wearing his junior collar, as he ventured into the sea. After a long walk along the beach, and a return through the pines, we headed back into town along the elevated path, to where we had parked the car. This is some distance, and takes around forty-five minutes to walk its whole length. I zoomed in on some of the boats moored there. It was late afternoon, and a hot day. You can detect the haze in the photos. The small town and harbour in the distance, only halfway along the path. If you are ever in the area of North Norfolk, I can recommend Wells as a great place to visit. You can combine it with a trip to nearby Walsingham, a place full of history and interest. Here are some links to both places. Thanks for sharing this link, Pete. I can picture the setting of the novel even more clearly in my mind now (the walk is described in a fair detail as well). All the best. Thanks, Olga. Not great photos, as it was hazy. And those beach huts are still the same, though I didn’t photograph them that time. Looks like a really tranquil afternoon out. The town was very busy in August, V, but the beaches and pine woods are so vast, you can still find lots of very quiet spots. It looks like a very pleasant walk. I noticed some of the boats are on a dry strand. Is it fair to assume they were left that way by a receding tide? The tide does come in and out there, David. Glad you liked the post. Next time, I will take photos of the beach and pine forest. These were old shots, from my SLR. For a moment there, I thought you wrote beech and pine forest. I imagine there are beech trees in…your neck of the woods. We have a Beech hedge, David, and our street is named Beech Road. However, most of the trees around here are Oaks, and the ones on the coast are pines. 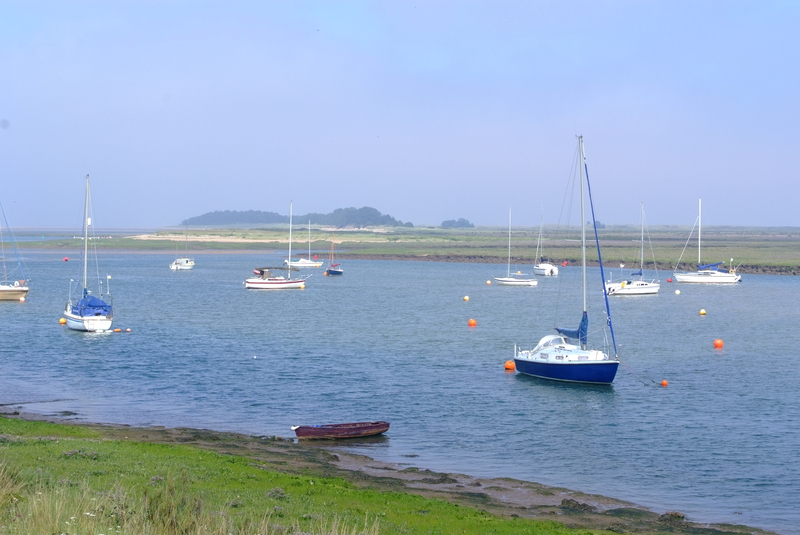 We didn’t even stop in Wells on our visit to North Norfolk as in August it is teeming! But we managed to park down Lady Anne’s Drive near to Holkham beach and do the Lady Anne’s walk which is really nice – we walked one way along the beach to the beach huts at Wells and then back along by the pines. Of course in winter it was a very different scene. Nice to see it again. I must have another holiday in Norfolk. This was a busy afternoon in August, Jude. We had been forced to park in the ‘overflow’ car park, the Football Club grounds, which is why we were doing the long walk back. Even on a wintry Sunday, the beach car park can be full. It seems to be becoming more popular than ever, so we may have to look for a different spot soon. Have you tried the east coast or is that a bit too far? We have been to quite a few places on the east coast. Besides Yarmouth, which is still too tacky, we enjoyed an afternoon at nearby Caister, and Mundesley is very small and attractive too. Hemsby is awful, the worst kind of commercial place, yet blessed with a wonderful beach and dunes. We have yet to visit Happisburgh and Sea Palling, but have seen most of the rest. It is only about an hour by car, (out of season) as it is less than 50 miles away. I even recognized many of the boats, that’s a comforting feeling being in the Rhine Valley at the moment. 🙂 It’s a great reward to finally reach the beach after the 45 minutes walk out of centre. So lovely to see Ollie in the water! Wells is booming at the moment, well that’s what I’ve been told anyway. Getting more and more Blakenyish, aiming for Burnham upmarket. I suppose ether’s hardly a spot left on the coast, being a true fishermen’s port. Does Brancaster beach also allow dogs? Wishing you all a wonderful rest Sunday! 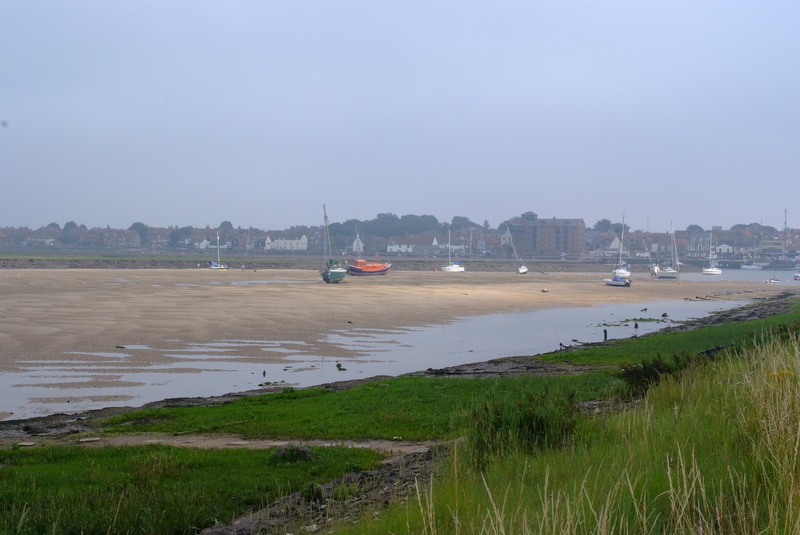 I haven’t been to Brancaster Beach, Dina, just the muddy Staithe, near the car park. My neighbours go there with a dog though, so I presume that they are allowed there. Glad you liked the photos, to give you some good memories when you are in Bonn. I think that the offshore wind farms and dredging businesses are causing a mini-boom for Wells. It remains to be seen if it results in the same gentrification as the other places you mention. I would happily show you around the whole area, Cindy, talking films as we drive! I am sure that would be a delightful visit. What I could see right now on my tab is a lovely view of the sea. Will come back for more of the pictures Pete. I hope you get to see them all, Arlene. I have posted three photo blogs this weekend. Always beautiful and quaint pictures, Pete. Thanks for including Ollie – you KNOW he would have been missed!! Lots of Norfolk is pretty quaint, GP. Glad you enjoyed these.